"The Hustler" played to a fair house at the Lansing last night. As specialty companies go the present "Hustler" company is unusually good. The people are mostly new and the whole production has been greatly improved since last season. From a specialty production the public does not expect plots or climaxes or even funny situations, but it does expect good specialties, handsome costumes, jokes even that were made at some time since the creation, and women at whom one can look without a sensation of pain. "The Hustler" did all this and even more. The costumes were all in excellent taste and perfect harmony of color. The women were not only richly but becomingly dressed. As to the women themselves, there were five and they were all pretty. Pretty women may not be necessary to a good performance, but there is no gainsaying that they are a very enjoyable luxury. Some of the jokes had been said before, but, by the way, most things have. The specialties were all good, and the male quartet was very fair, though one of the tenors had a fatal tendency to get away from the rest. The hat kicking act was done particularly well. In short the whole performance fulfilled the great dictum de omni et nullo of all farce comedy: "The girls were pretty The boys were witty." John Tierney as McFadden and Harry Watson as Busch seem well adapted to comedy of that nature, and it is doubtful if they could easily be improved upon. Mamie Mayo in her song, the "Bowery Girl," was altogether refreshing. She had little or no voice, but after she once smote you with her smile and "told you her eyes" you didn't mind that. Miss Mayo has one of those aggressive personalities that walk right over the footlights. She sings—and smiles—in dead earnest and "wades right in." as the gallery boys would say. She has a robust physique and plenty of warmth and is very much alive, and nobody minds at all that it is a little shady, enough to make it "refreshing." Mr. Harry Watson in his song and dance in effeminate trousers was many times encored, and like the cat that is not unknown to fame, he came back, "For he couldn't stay away." The Hustler: The New York Times reviewer called The Hustler "the usual variety exhibition" when it opened at the Bijou Theater in New York (24 November 1891). The original company included John and Henry Kernell; Gus Mills, a female impersonator; Barney Reynolds, Mollie Thompson, and Rose and Hilda Laporte. 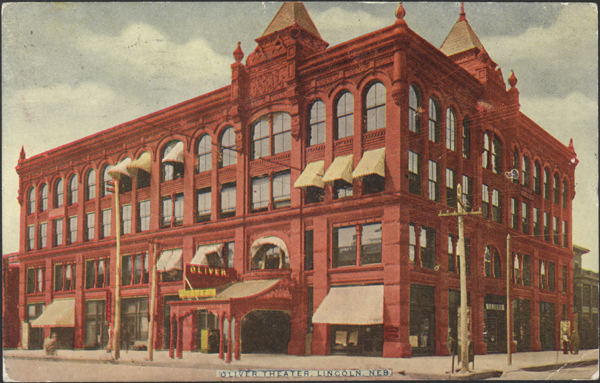 The Kernell company played in the New York area theaters for several years, occasionally changing some of the specialty acts, according to Odell (XV). Specialty production: A specialty production might have a loose plot designed to show off individual performers' specialties, or acts, such as dancing, singing, juggling, magic, etc. Hustler Company: The company that brought The Hustler to Lincoln in 1894 included John Tierney, Harry Watson, and Mamie Mayo, none of whom had appeared in the New York production. dictum de omni et nullo: Literally, [what is] said of each and of none. In logic, this axiom holds that what is said of a logical whole is true of its logical parts. The girls were pretty / The boys were witty: The source of this quotation has not been found. John Tierney: Odell (XV) notes a vaudeville performer, John T. Tierney, playing a few times in the New York area c. 1893. Con McFadden: Con McFadden is the leading character in The Hustler (1891). Harry Watson: Odell (XV) notes a vaudeville troupe, the Harry Watson Novelty Company, playing in the New York area in August 1893 (736). Busch: Busch is one of the leading characters in The Hustler (1891). Mamie Mayo: No actress named Mamie or Margaret Mayo is listed in the indexes to Odell's Annals of the New York Stage or the New York Times drama reviews for this period. 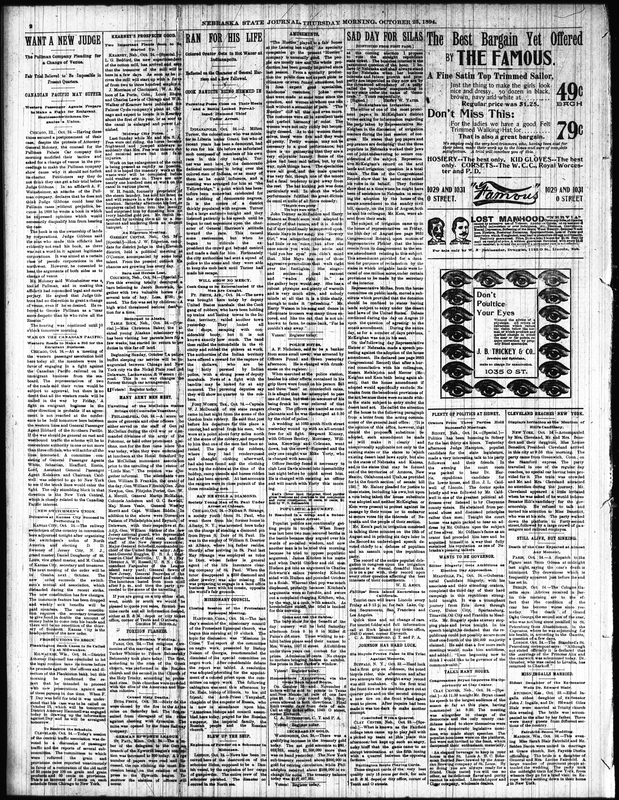 She appeared in Lincoln, Nebraska, in The Hustler on October 24, 1894. Bowery Girl: The New York Times described "The Bowery Girl" as Annie Hart's song in an article on July 1, 1894. A play by Ada Lee Bascom, A Bowery Girl, lasted for eight performances on Broadway in December 1895. Another possibility is the somewhat better known song, "My Pearl is a Bowery Girl," with music by Andrew Mack and words by William Jerome (1894). smote you with her smile: The source of this allusion or quotation has not been found. Told you her eyes: "Told you her eyes" may have been a slang or catch phrase, elliptical for "told you with her eyes." The cat that is not unknown to fame, be came back, "For he couldn't stay away": The humorous song, "The Cat Came Back," is attributed to Harry S. Miller. It now has many variations, telling how a man tries to get rid of a cat that keeps hanging around—putting it on a train, sending it up in a balloon, sinking it in a lake, and many other far-fetched methods, but, as the chorus says,	But the cat came back the very next day,	The cat came back, we thought he was a goner,	The cat came back, he just wouldn't stay away.